Setola di Maiale is a radical label of independent musicians, improvisers and composers. It was set up in January 1993 by musicians Stefano Giust and, in the early, Paolo De Piaggi, with the clear intent to highlight creative music. The main purpose of Setola di Maiale is to compensate a widespread need in the community of adventurous and experimental musicians, ie to give body and continuity to creative musics, providing a further opportunity that can document, at least in part, the path of a non-commercial musical project. Setola di Maiale is founded on direct participation and on the peculiar creativity of all musicians involved in their music productions. From this way of working, many forms of collaborations were born along with meetings, friendships, festivals, the performances at the 48th Venice Biennale or at Radio Resonance of the London Musicians’ Collective. The catalogue, initially printed on paper, documents both the music and the experiences of this years of work. It offers official works of soloists and groups, in the fields of so-called avant-garde, such as free improvisation, free jazz, electroacoustic, modern composition, acousmatic, electronic music. Contemporary music in its wider form of expression. The productions – very careful high quality cdr’s, just to say that cdr’s can be professionally well done, and the music can be great – are released with the supervision of the artists, that saw all aspects. We work in a very free manner. I take care personally of every graphic design project, being a graphic designer with professional experience. Setola di Maiale is neither a commercial label nor an association: is rather a laboratory/archives that operates within a free and creative environment. The polemical Prieberg’s words, the exergue above, has always been used since the very beginning of the label. Note that nothing is changed in more than 50 years and rather, the issues have worsened. DIY attitude is inevitably the only way for certain type of music to exist, in a market that either is clearly not there, or is stereotyped. Setola di Maiale could be thought as a pure commercial utopia. Through the years, Setola di Maiale has released my work as well as the work of several international acclaimed musicians and many brilliant artists not so well known. Up to now I’ve produced more than 380 titles involving 650 musicians, among others (in alphabetical order): Benat Achiary, Carlo Actis Dato, Apartment House, Lotte Anker, Marco Ariano, Mick Beck, Richard Benjafield, Burkhard Beins, Michael Bisio, Silvia Bolognesi, Alberto Braida, Peter Brötzmann, Cristiano Calcagnile, Kent Carter, Alipio Carvalho Neto, Gendos Chamzyryn, Stefano Cogolo, Eugenio Colombo, Marco Colonna, Paed Conca, Philip Corner, Paulo Chagas, Michel F. Côté, Vittorino Curci, Francesco Cusa, Roberto Dani, Rhodri Davies, Massimo De Mattia, Tobias Delius, Jean Derome, Tom Djll, Francesco Dillon, Marco Eneidi, Shanir Ezra Blumenkranz, Massimo Falascone, Ettore Fioravanti, Gianni Gebbia, Frank Gratkowski, Phillip Greenlief, Brian Grimm, Vinny Golia, Nicola Guazzaloca, Francesco Guerri, Jean-Luc Guionnet, Teppo Hauta-Aho, Stephen Haynes, Chris Heenan, Taylor Ho Bynum, Tim Hodgkinson, Tristan Honsinger, Ken Hyder, Matt Ingalls, Xabier Iriondo, Zlatko Kaučič, Kim Ngoc, Peter Kowald, Joëlle Léandre, Pablo Ledesma, Gianni Lenoci, Lino Liguori, Anton Lukoszevieze, Marcello Magliocchi, Giovanni Maier, Edoardo Marraffa, Bob Marsh, Sabir Mateen, Gianni Mimmo, Luca Miti, Yoko Miura, Filippo Monico, Manuel Mota, Martin Mayes, Guido Mazzon, Thollem McDonas, Lisa Mezzacappa, Kanoko Nishi, Tim Perkis, Jeff Platz, Maresuke Okamoto, Patrizia Oliva, Stefan Östersjö, Roy Paci, Giorgio Pacorig, Steve Potts, Wolfgang Reisinger, Edoardo Ricci, Gino Robair, Daniele Roccato, Enzo Rocco, Paul Rogers, Marco Rogliano, Olaf Rupp, David Ryan, Mirko Sabatini, Eugenio Sanna, Giancarlo Schiaffini, John Shiurba, Massimo Simonini, Blaise Siwula, Harri Sjöström, Damon Smith, Andrew Sparling, Pham Thi Hue, Clayton Thomas, Philip Thomas, Sabu Toyozumi, Ken Ueno, Vincenzo Vasi and Carlos Zingaro. If you like these type of choices, probably you know how difficult is to survive making non commercial music, expecially without institutional funding: you can support Setola di Maiale, just buy one or more albums through the website. Anyway, thank you for having thought on this. These 25 years of activity have been remembered at the 28th edition of Angelica Festival Internazionale di Musica (Bologna), not for a self-congratulating celebration, but for a further opportunity to promote a vision of ‘other music’. 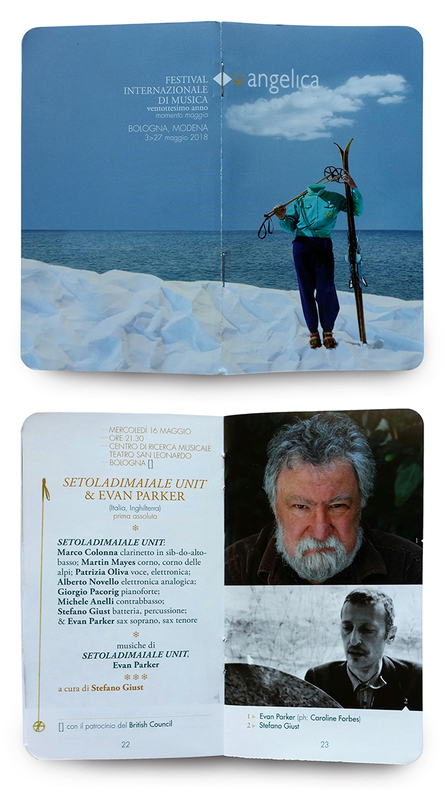 As an ensemble, Setoladimaiale Unit is a possible synthesis of the label that, in this particular circumstance, has played with Evan Parker, an essential musician of free improvisation/free improvised music, and it is to this historicized ‘tradition’ that Setola di Maiale wants to continue to be approached, in a moment in which everything wants to shine with its own light, here there is a need to reiterate the continuity of an ‘enunciated spirit’, a continuity with an artistic attitude capable of expressing in different ways, always moved by a will of strong independence and self-determination: for all of us, still a revolutionary music. A grateful and great thanks to the artistic director of the festival, Massimo Simonini, who made all this possible. 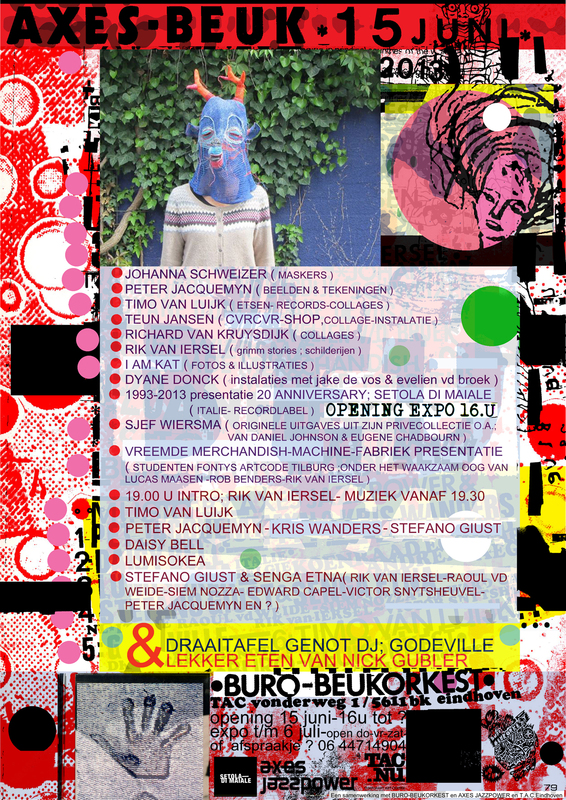 Setola di Maiale has celebrated its twentieth anniversary as part of Axes Beuk Festival at TAC-Temporary Art Center in Eindhoven, Netherlands, on 15th June 2013. There was an exhibition – open from 15th June to 16th July – with all the records produced over the years and concerts of improvised and experimental music. All of this was possible thanks to the interest and production of Rik van Iersel, Buro-Beukorkest and Axes Jazzpower.